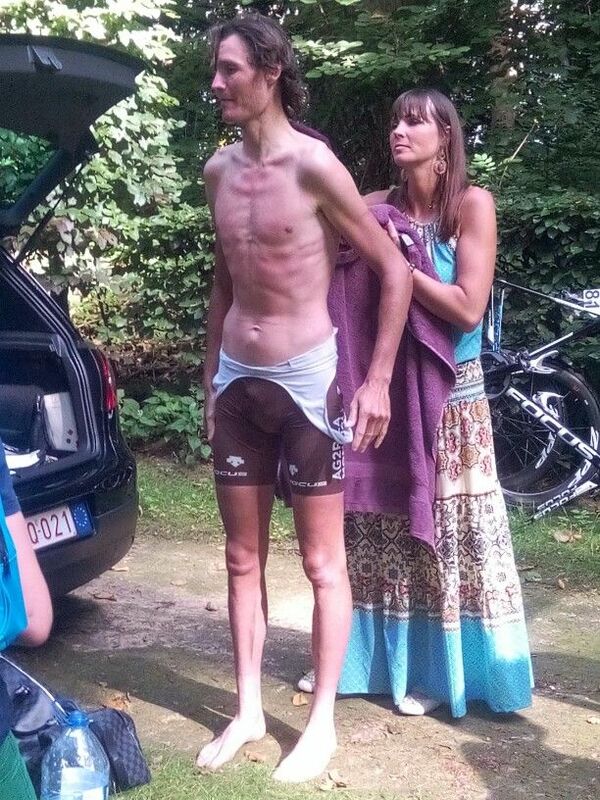 You can even win Paris-Roubaix while being skinny. Anderis wrote: You can even win Paris-Roubaix while being skinny. That pic is from last year, not 2011. Wikipedia says Johan's lost 3 kg of body weight since winning Paris-Roubaix. It would explain why his performances in recent years have been so... disappointing. I doubt losing 3kg had anything to do with it. Anyhow, 10 years ago due to work and family commitments I didn't have the time to ride on the road mid week. So I did all my mid week training in a gym next to my office. Upper body work was mainly limited to body weight exercises like chin ups and push-ups and bench press usually 3 sets of 12-15 reps - not huge weights. The idea was to keep the heart rate up for the full workout. I also did a lot of core strengthening work which was awesome. The workout program usually took about 90 minutes but crucially included two sets of high intensity intervals on a bike machine where I monitored my power output and heart rate plus a 2km warm down on a treadmill. The entire workout including weights was primarily aerobic. Anyhow on this program I was able to get fit enough to win my club races on Sundays against guys who only rode on the road. But when you are on your limit on a long climb any extra upper body muscle isn't going to help you. The main advantage of weights if done right is to build lean muscle without adding bulk and strip off fat. It can work as a substitute as long as supplemented by high intensity aerobic training. ps - sorry all for bumping this thread. Cookster15 wrote: Anyhow, 10 years ago due to work and family commitments I didn't have the time to ride on the road mid week. So I did all my mid week training in a gym next to my office. Upper body work was mainly limited to body weight exercises like chin ups and push-ups and bench press usually 3 sets of 12-15 reps - not huge weights. The idea was to keep the heart rate up for the full workout. I also did a lot of core strengthening work which was awesome. The workout program usually took about 90 minutes but crucially included two sets of high intensity intervals on a bike machine where I monitored my power output and heart rate plus a 2km warm down on a treadmill. The entire workout including weights was primarily aerobic. Anyhow on this program I was able to get fit enough to win my club races on Sundays against guys who only rode on the road. Let's look at this from a rationalist perspective. What would a rational person do: assume the observations are wrong or assume the theory is wrong? You beat me to the punch! I was going to say a little heavy bag, some speed bag, and then some sparring. Most of the original power pose findings were tested in a social context, with real experimenters and participants engaging in social tasks. The replication, however, removed all interactions with other people so that they could not unknowingly bias the participants. Seeing as "power" is a social construct and exerted in relation to others, it seems reasonable to think the testosterone rush and cortisol decrease would only occur if your brain believes you are in a position to exert that power over other members of your "herd". You seem to be conflating two entirely separate meanings of the word 'power'. Has anyone ever claimed that having a muscular upper-body can't be beneficial for a classic specialist, it's for GC riders it's not very useful. And of course, as has been mentioned several times, the fact that the GC riders don't have clearly defined muscles in their upper-bodies doesn't mean they don't train their upper-bodies. Cannibal72 wrote: You seem to be conflating two entirely separate meanings of the word 'power'. Social power will not directly give you an extra 200 watts. But its physiological effect is real: social power boosts natural testosterone production, which in turn increases muscle growth and improves cardiovascular health, translating into extra watts on the bicycle. What a way to pick out the things you want to hear. RedheadDane wrote: And of course, as has been mentioned several times, the fact that the GC riders don't have clearly defined muscles in their upper-bodies doesn't mean they don't train their upper-bodies. Upper-body strength gain has its benefits, but the real advantage comes from increased upper-body muscle mass (i.e. muscle hypertrophy or, in plain terms, big muscles). That's because there's a limit to how strong a muscle can become before it needs to grow bigger. Sorry, but Track Cycling Sprinters don't do a lot of upper body work and they certainly don't try and gain upper body muscle. NZ and Aussie Sprinters actually look even more freakish with large legs and average upper bodies.